Moreover, economic incentives surrounding conventional weapons also cut against the promise of peace on the Korean Peninsula. Eric Sirotkin, founder of Lawyers for Demilitarization and Peace in Korea, has pointed out that South Korea is one of the largest importers of conventional weapons from the United States. If North and South Korea achieve “a lasting and stable peace regime on the Korean Peninsula,” as envisioned by the agreement between Trump and Kim Jong Un, the market for US weapons could dry up, according to Sirotkin. Last year, more than 120 countries approved the Treaty on the Prohibition of Nuclear Weapons, which requires ratifying countries “never under any circumstances to develop, test, produce, manufacture, otherwise acquire, possess or stockpile nuclear weapons or other nuclear explosive devices.” It also prohibits the transfer of, use of, or threat to use nuclear weapons or nuclear explosive devices. Since the treaty opened for signature on September 20, 2017, 58 countries have signed and 10 have ratified it. Fifty countries must ratify the treaty for it to enter into force, hopefully in 2019. The five original nuclear-armed nations — the United States, Britain, France, Russia and China — boycotted the treaty negotiations and the voting. North Korea, Israel, Pakistan and India, which also have nuclear weapons, refrained from participating in the final vote. During negotiations, in October 2016, North Korea had voted for the treaty. However, when the summit was in the planning stages and before Trump anointed John Bolton as National Security Adviser, Bolton skeptically predicted the summit would not deter North Korea from acquiring nuclear weapons. Meanwhile, Trump claims he has achieved something his predecessors — particularly his nemesis Barack Obama — were unable to pull off. “There is no longer a Nuclear Threat from North Korea,” Trump tweeted upon landing in the United States after the summit. Five minutes later, he again took to Twitter, declaring, “Before taking office people were assuming we were going to War with North Korea. President Obama said that North Korea was our biggest and most dangerous problem. No longer — sleep well tonight. The significance of the Singapore Summit should not be underestimated. 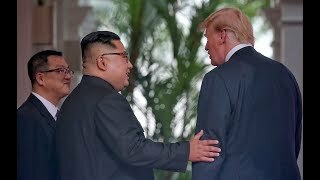 Trump is the first US president to meet with the leader of North Korea. Trump showed Kim respect, and Kim responded in kind. Trump and Kim made a major commitment to peace. We should applaud and support it, and encourage Trump to sit down with Iran’s leaders as well. The joint agreement signed by the two leaders in Singapore was admittedly sketchy, and denuclearization will not happen overnight. But the agreement was a critical first step in a process of rapprochement between two countries that have, in effect, been at war since 1950. Indeed, the United States has continued to carry out military exercises with South Korea, which North Korea considers preparation for an invasion. In a critical move, Trump stated at the post-summit press conference that the United States would suspend its “very provocative” war games. Trump also announced a freeze on any new US sanctions against North Korea and indicated that the United States could lift the current harsh sanctions even before accomplishing total denuclearization. Kim promised to halt nuclear testing and destroy a testing site for ballistic missile engines. Ultimately, however, it is only global denuclearization that will eliminate the unimaginable threat of nuclear war. Next Is Anti-War Fever Building in the U.S.?